My personality is such that once the Christmas decorations come down, I discover myself looking out the window and searching vainly in the garden for signs of Spring, even though I know there are months of Winter yet to pass. Over the years, I have discovered a means to ameliorate this unfortunate character flaw, I go to Columbia Rd Market and buy bulbs to create Spring indoors in January. 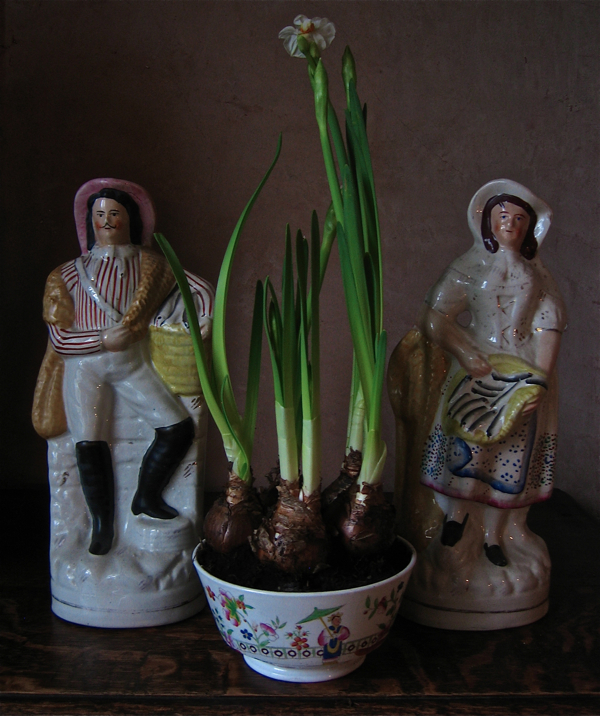 It never fails to lift my spirits when – walking into the living room each morning – I am surprised by the heady scent of Hyacinths, sprouting in a dish upon the dresser. 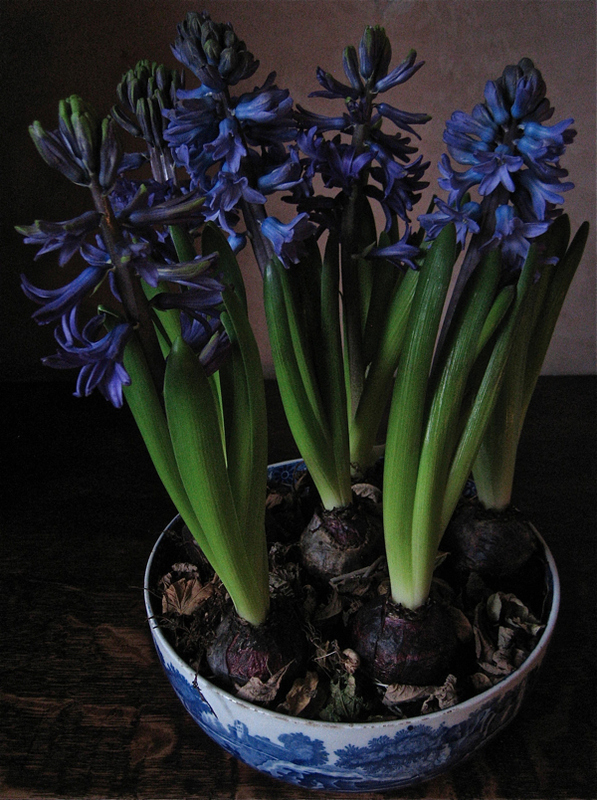 You may recall those that I plant annually in the old blue bowl which, after last year’s aberration of pink flowers, turned out blue again, thus permitting my grandmother who started this Hyacinth rigmarole to sleep peacefully in her grave for another year. The scented Paper-whites above cost me just £1 at Columbia Rd and they fit nicely in this fine early nineteenth century porcelain bowl that I found in Brick Lane Market for £5. 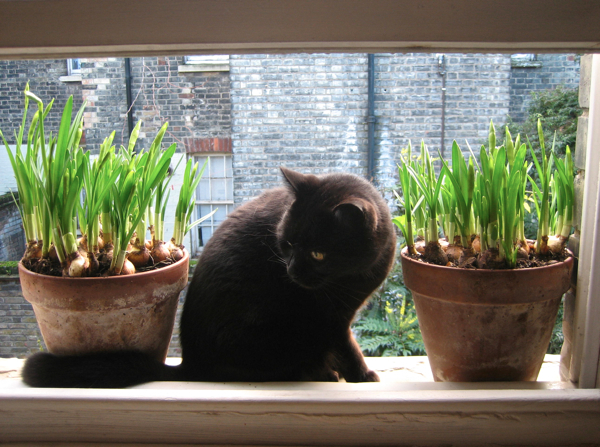 Prices for Winter bulbs at Columbia Rd have dropped dramatically since Christmas with potted Amaryllis that I bought for £3 in December now on sale at just £1, which makes it worth braving the weather to go along and bring some home to elevate your days. 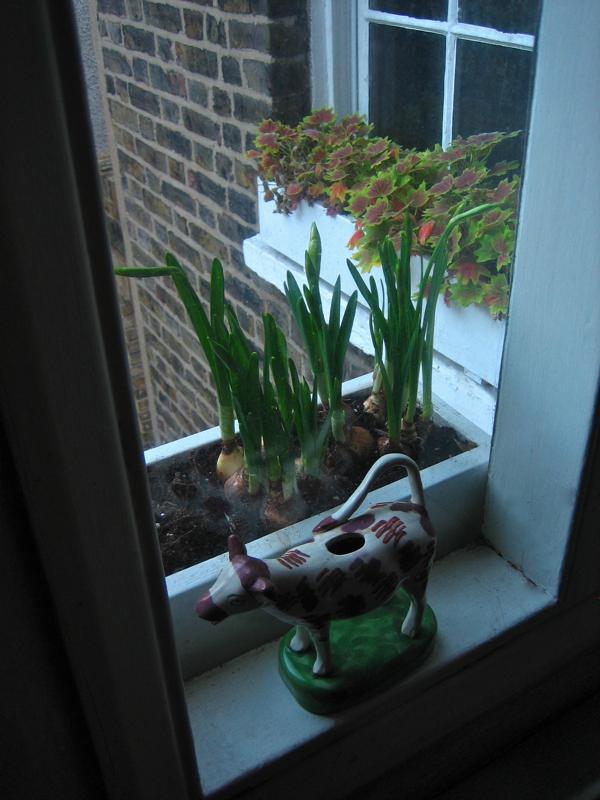 £1 also buys a pot of miniature Daffodils, which encouraged me to buy a tray of ten and fill two flowerpots on my window sill, so that I can look out and be rewarded with the sight of new life, even while the garden itself is dormant. Now each day brings me new growth to sustain my hopes, as a harbinger of the Spring that I know will come eventually. Beautiful images, beautiful words, and a beautiful family tradition kept alive. Many thanks for this. Ooh lovely , spring flowers already. Note to self… hibernate until spring is truly here. Lovely to wake up to on Sunday morning, but Gentle Author, I hope you will now have the day off. How lovely to wake up to newly opened flowers in this cold and depressing month! 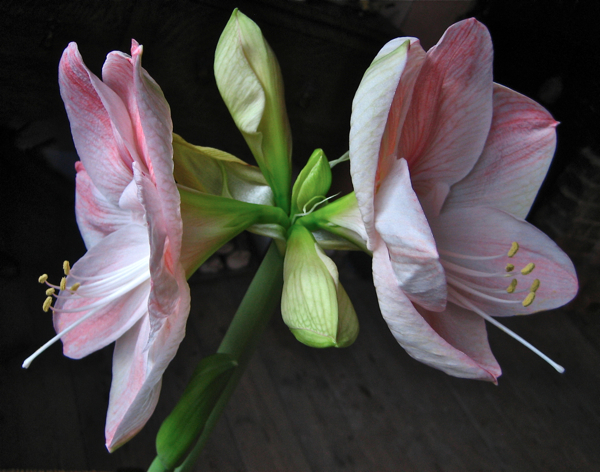 I have a gorgeous amaryllis that a friend gave me and I think just as you do when I look at it: spring will be here. Someday, anyway! Cold, cold, cold here. I know exactly what you mean , I have to have little signs of growth else I may start to panic ! Living in Florida it’s always easy to forget how the lack of color can affect one’s mood. As such, bulbs have never found a place in our home because there are still blooms outdoors. Your lovely images have convinced me to buy some bulbs for the indoors as well.